Posh midfielder Brad Inman played well at Chesterfield. Manager Grant McCann has pledged to fight until he gets it right at Peterborough United. The moaners and the knockers have been out in force in recent weeks as the club’s League One play-off hopes have all but disappeared. Posh have won just four of 15 League One games in 2017. Marcus Maddison could be back in the Posh squad against Oldham. McCann has admitted to mistakes in his first season of management, but he is confident he, his staff and his players will get it right eventually. Posh host in-form relegation battlers Oldham at the ABAX Stadium tomorrow (March 18, 3pm kick off) seven points off the play-off places with eight matches to go. “Management is not as easy as people might think,” McCann stated. “It’s certainly a lot easier when you’re just sat in the stands. “I’ve had to learn very quickly, but I am still enjoying it. I come to work with a smile on my face every day. I’m still very positive. Posh midfielder Leo Da Silva Lopes will be in the squad for the Oldham game. “I’m fortunate in that I have great support from the chairman, from (director of football) Barry Fry and from my management team. “And I have confidence in the players. “It is what it is though. I chose to go into management and I will fight every day until we get it right. What happens between Monday to Friday is irrelevant if the result is bad on a Saturday. “I believe we have turned a corner at Chesterfield (Posh drew 3-3 there on Tuesday) and we’re looking forward to proving that against Oldham. “It won’t be easy as (manager) John Sheridan has turned their fortunes around again. They have a side stacked with experience, but we will focus on ourselves as usual and if we get that bit right we will win the game. 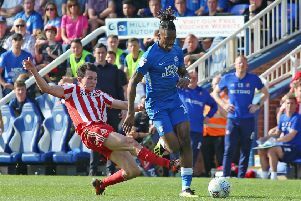 Marcus Maddison is expected to return to the squad tomorrow after recovering from an ankle injury, while teenage midfielder Leo Da Silva Lopes is available after serving a one-match suspension. They both might have to start on the substitutes’ bench though as McCann was impressed with his players at Chesterfield. “We should have beaten Chesterfield comfortably,” McCann added. “Lady luck didn’t shine on us, but we will make sure we make our own luck tomorrow. “It’s good to have Marcus and Leo back in the squad, but Paul Taylor has been outstanding in the last couple of matches and Brad Inman played well at Chesterfield. “Junior Morias is knocking on the door for a start as well and I hope the fans stick with us for the rest of the season.